Industry data reveals that refueling your own equipment can be costly, time-consuming and hazardous for operators and the environment. Schedule delays, capital expenditure including compliance requirements may all lead to a reduction in profitability and impact on your ability to compete in the marketplace. On-site refueling demands need to be taken seriously in today’s business environment. The true cost of refueling your own equipment is not only the price you pay at the pump, or bulk fuel delivered into your own storage; but also the significant hidden costs. Mini-Tankers have the experience, capabilities and resources to ensure that refueling your fleet, including consumption management, doesn’t have to be a problem, and leaves you to get on with what is important to your business. If you’re passionate about increasing production, using less fuel and reducing risk; then Mini-Tankers can help you. 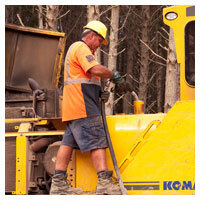 Mini-Tankers have been an essential component of New Zealand's construction and roading sectors for many years. Refuelling services offered include diesel direct to equipment, direct to on-site tanks, and after hour deliveries to meet your particular site requirements. All Mini-Tankers are equipped to produce comprehensive consumption and billing data via our on-board computer systems; showing GST details, cents per litre and fuel quantity delivered. We also supply lubricants, greases, grease guns and paints. Mini-Tankers have become part of the solution for jobs both large and small throughout the entire country. Essentially, we excel at saving you time and money by managing your fuel consumption, reducing schedule disruptions and mitigating risks associated with each project. "You can trust the drivers at Mini-Tankers because they're professionals. They certainly know what they're doing" would be typical of what our clients say about us. Remote locations, demanding terrain and numerous potential hazards are the challenges for the forestry industry. The men who work in these environments are tough, resourceful, and operate some of the most sophisticated machinery in New Zealand. Our team at Mini-Tankers are highly trained professionals who drive modern, versatile tankers; often under very challenging conditions, in order to refuel equipment and stationary tanks for the forestry industry. At Mini-Tankers we understand forestry contractors and work towards negating any disruptions to your business. Detailed planning, refuelling during downtime, and harmonizing with your work schedules are very important to us. Motivated by a job well done, our drivers appreciate customer comments such as "an attention to detail, like topping-up tanks properly in order to avoid the formation of condensation. This is just one of the many reasons why we keep using Mini-Tankers." Numerous contractors, in a variety of business sectors, operate in very competitive commercial environments, and look for every business advantage. By arrangement with your Regional Account Manager, Mini-Tankers can offer early morning or night fill refuelling because listening to our customers and embracing innovation are pivotal to our service philosophy. Similarly, we are able to provide customized consumption reporting; detailing refuelling frequency, equipment and tanks filled, quantities delivered and cents per litre. There are fewer potential hazards during early morning or night refuelling because the site is, often, temporarily dormant. After hours refuelling can be a sensible business option because interruptions to busy daily schedules are reduced, accelerating productivity and enhancing your competitiveness in the marketplace. Diesel boilers are a popular home heating option for both radiator and under floor systems. The home heating diesel tanks have an average capacity of approximately 500 litres, while commercial tanks can be much larger. Avoid taking unnecessary risks when its time top-up by calling in the professionals. Safety considerations, for both people and the environment, cannot be underestimated. Mini-Tankers will refuel domestic and commercial tanks quickly, safely and cost-effectively. At Mini-Tankers, we pride ourselves in offering an important service to industry and the community. Our drivers enjoy getting to know our clients, many of whom have been using our services for years. "No fuss, quick service and friendly” is what our customers say about us. New Zealand is an island nation with numerous wharfs and ports dotted around our extensive coastline. Inevitably, large quantities of diesel are pumped into vessels of every description. Mini-Tankers excel at marine refuelling; either direct to vessel or with assistance from port authority staff for larger vessels. Because there are a number of ports that have wharf weight restrictions, Mini-Tankers are an ideal marine refuelling solution. The safety and environmental considerations associated with marine refuelling are extremely important. Professionalism and robust operational systems are paramount at Mini-Tankers, as every contingency has been addressed to the highest standards. We comply with port authority operational procedures and have developed an advanced, end-to-end risk management program. All relevant insurance covers are in place, and each truck is equipped with the latest safety equipment. Payment options include cash, cheque, MasterCard, Visa and Direct Debit. We also participate in Fly Buys or Airpoints™ rewards. 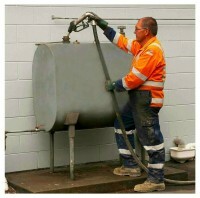 Mini-Tankers are the largest and most successful on-site refuelling company in New Zealand. Hard work, listening to our customers and a genuine desire to explore innovative refuelling solutions are the reasons for our success. We're all about superior systems, better service coverage, technological innovation and brand credibility. Pride in our achievements is reflected in a determination to provide the very best service for all our customers. Sustainability is important to us and our customers. It is becoming clear that the number of small volume deliveries is increasingly impacting traffic, delivery times, and inefficiencies that are uneconomical to maintain. To address this, while providing the ongoing service ensuring our customers get their diesel delivered when they need it, a service fee may apply for any delivery of less than 150 litres per visit.